Make no mistake about it, virtual assistant speakers are going to be the “it” thing for 2018. 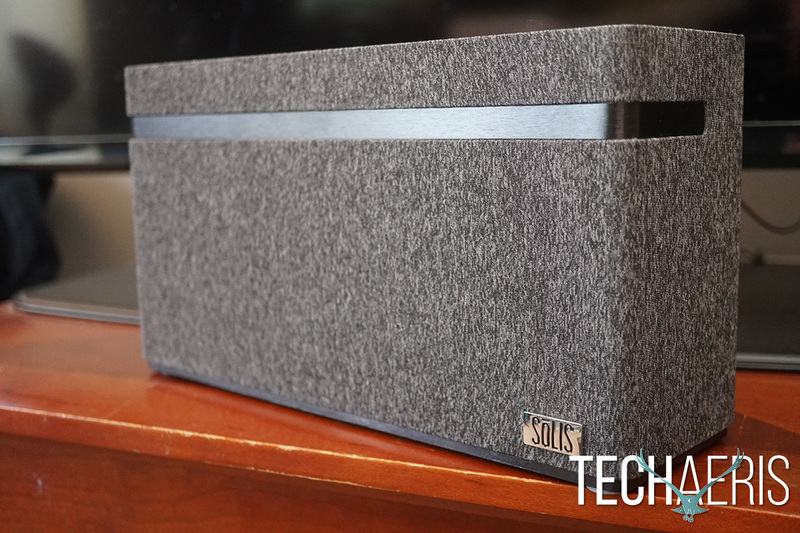 We’ve already reviewed a handful of these speakers and this time we’re taking a look at the SōLIS SO-3000. 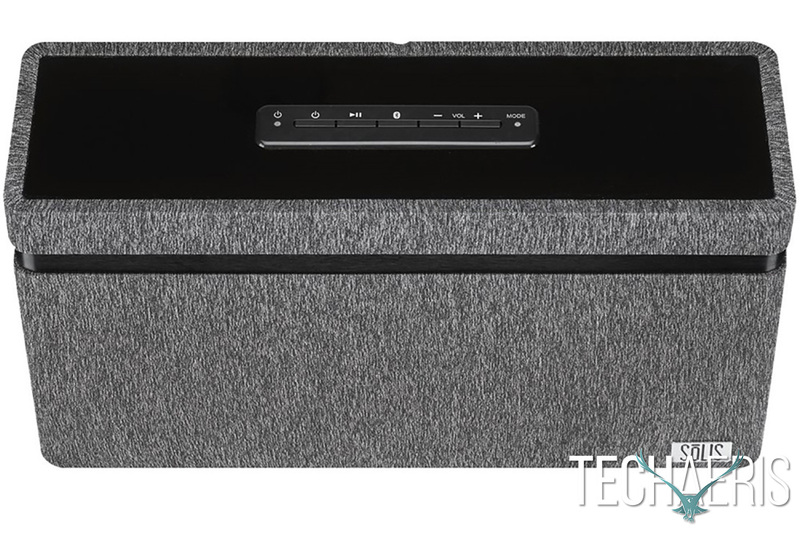 The SōLIS SO-3000 isn’t a full on Google Assistant speaker but it does have a lot of the same functions when using the app or Google Home device. While there are is a fair amount of choice on the market, some of those choices don’t offer the same level of sound excellence the SōLIS SO-3000 does. But that doesn’t mean the SōLIS SO-3000 is perfect. Read on for our full review of the SōLIS SO-3000 and find out what we loved and what you might not love so much. Many of these new Chromecast enabled and Google Assistant speakers aren’t much to look at, but the SōLIS SO-3000 at least has style. The entire speaker is covered in an attractive heather like fabric giving it an elegant look. The black band around the speaker adds a nice accent and the SōLIS branding on the bottom right finishes off a nice presentation. Around the back of the SO-3000 is the tuned bass port, AUX in, reset button, and barrel port for power. There is nothing along the sides. On the bottom, you’ll find the rubber feet, which are oddly opaque. I would have liked to see them in black as I feel they look strange but not a deal breaker as they’re pretty much unseen. 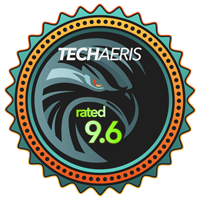 The entire speaker feels very premium and the materials used are all high quality. The speaker looks and feels like it costs more than it does and that’s really a great thing. It’s also fairly solid, it’s not super heavy but there is a bit of heft to it. Which is interesting considering there is no battery in this speaker, which means it is not portable. Overall, this is probably one of the best looking and designed Google Assistant speakers I’ve used to date. It’s built and made well enough to look more expensive than its $199.99USD price tag. There are a few ways to use the SōLIS SO-3000. The first and least involved way is using Bluetooth. Simply plug the speaker in and press the Bluetooth pairing button until you enter pairing mode. Once there, head over to your device and choose the SO-3000 in your Bluetooth list, you’re done. The second way is to connect using the Google Home app which uses your Wi-Fi network. This way is a bit more involved but super easy. Plug your SO-3000 in, power it up, head over to the Google Home app and look for the SO-3000 on the list. Follow the instructions in the Google Home app and when you have that complete, you’re connected. Overall, this is a very simple speaker to setup and use. Bluetooth is probably the easiest connection method but you won’t get the Assistant features using this method. I’d highly recommend setting the speaker up in the Google Home app on iOS or Android, it will deliver the best experience. I’ve been testing some of these new Chromecast and Google Assistant speakers out for the past few months. The SōLIS SO-3000 is easily the best sounding speaker in this size that I’ve tested so far. It easily fills a mid-sized room with rich vibrant sound that has a subtle yet noticeable emphasis on the low end. The highs and mids sound very balanced and the bass does an excellent job of being the foundation and not overtaking anything else. Turning the volume up gives no noticeable or discernable distortion but things do get sort of thin at full volume, which isn’t a deal breaker for me since I never put my speakers to max volume anyway. The soundstage is rich and full and sound reproduction is balanced throughout the frequencies even with the bass tuned a bit higher. 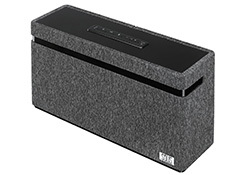 Overall, this is some of the best sound I’ve heard from a $199.99USD virtual assistant connected speaker. It certainly is better than the smaller Google Home speaker. Bluetooth reception is industry standard here, 30-40 feet from the source. Connecting this to Google Home will give you the best reception since it is done over Wi-Fi and I highly recommend you use this method, it is what I used. Plus it will let you connect to any other Chromecast/Google Assistant devices you have on the same network. The price tag on the SO-3000 is actually very competitive for a speaker of this size. The sound on this alone is worth the $199.99USD price but there are a few things not here some users may want. The lack of battery and portability may not resonate well with some. The lack of direct voice control of the Google Assistant may also turn some buyers off. 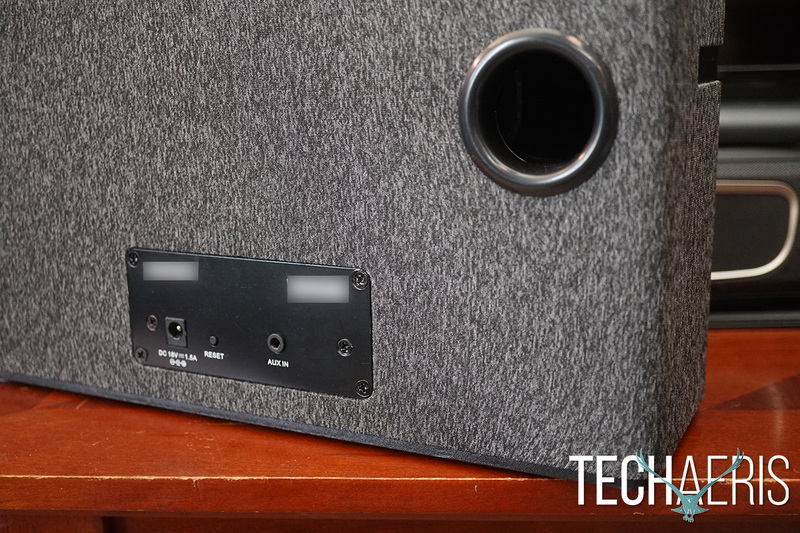 Still, I think this speaker holds great value, but you may not agree. 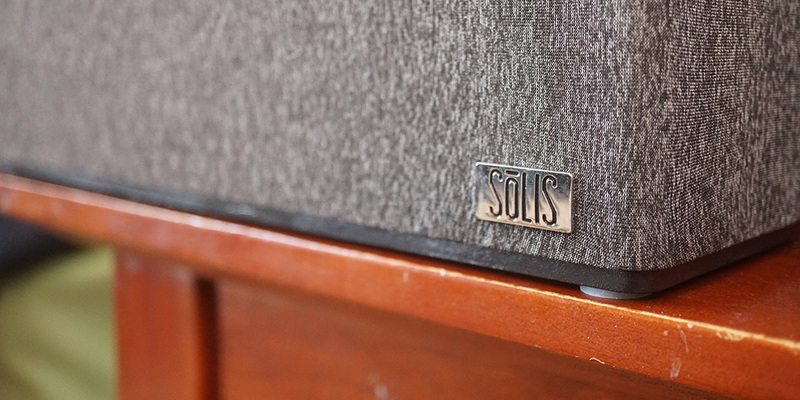 Like most products, the SōLIS SO-3000 is probably not for everyone. It’s missing a battery making it very unportable and it’s lacking direct voice control of Google Assistant. But even with those two omissions, it is really the sound that is the star here. I can forgive those two missing features because the SO-3000 just sounds amazing. If you own a Google Home or another Google Assistant device with voice control, you can control the SO-3000 with those. Of course, you can always control the SO-3000 through the Google Assistant app on your iPhone or Android phone. 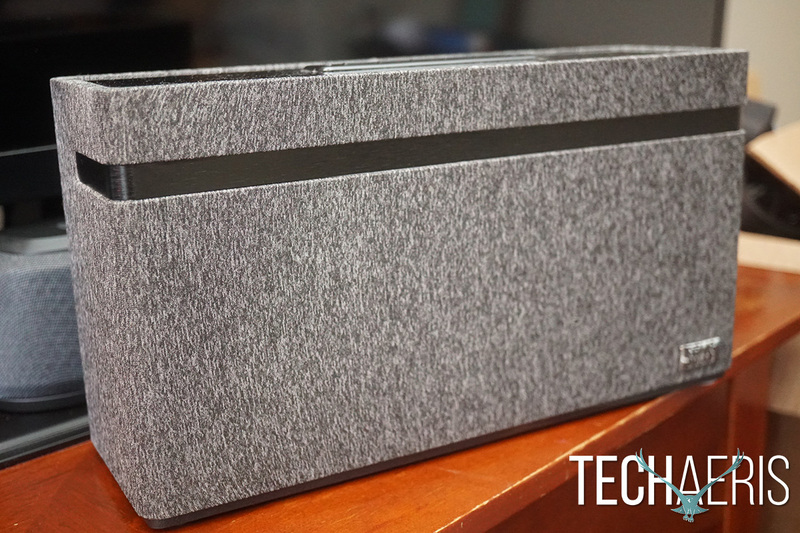 However, if you really need battery portability and voice control, this speaker is obviously not going to be for you. *We received a review unit of the SōLIS SO-3000 for the purposes of this review.